After testing multiple Quick Actions on its Android app notifications over the past few weeks, WhatsApp has finally started rolling out a new feature in the latest beta version of the software. First reported by WABetaInfo, the ‘Mark as Read’ feature is now live on version 2.18.232 of WhatsApp Beta. 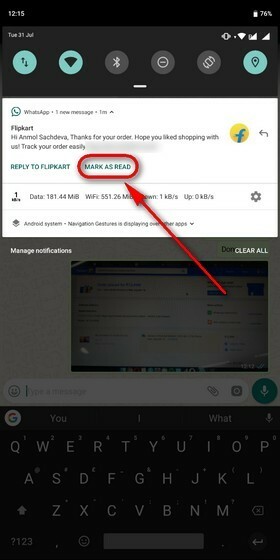 It is worth noting here that, evidence of the new Mark as Read button was spotted in the code of WhatsApp Beta v2.18.214 earlier this month, although, it is only now that it has gone live. As can be seen from the screenshot above, the new feature is already working for many users, including some in our office. It is also worth noting that Mark as Read is not the only Quick Action that WhatsApp has been testing in recent weeks. Alongside the Mark as Read button, another new Quick Action being tested by the company is a ‘Mute’ button that will let users mute a chat from the notifications itself, without opening the app. The feature, however, is yet to be rolled out publicly, and there’s no word on when that will happen, either. The latest beta version of the app (v2.18.232) can be downloaded from the Play Store by all registered beta testers of the app. It is expected to be rolled out to the stable version of the app sooner rather than later. In case you’re not a beta tester but want to stay on top of all the new features, you can apply to get into the company’s beta program and see if slots are still available.